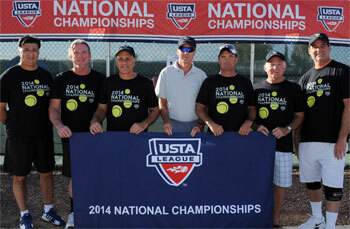 USTA Florida teams won an astounding three of the four first place titles over the weekend at the 2014 USTA League Adult 55 & Over 6.0 & 8.0 National Championships, held Oct. 31-Nov. 2, 2014 in Surprise, Ariz. The record haul in one weekend for Florida teams included both the men's and women's 55 & Over 6.0 championships, and the women's 8.0 championships. The Ft. King Tennis Center in Ocala took home both the men's and women's 55 & Over 6.0 championships, with the men in the final defeating the USTA Southern Section (Covington, La.) 2-1. Earlier in the day the Ocala men defeated a team from Minneapolis-St. Paul, Minn. 2-1 in the semifinals. 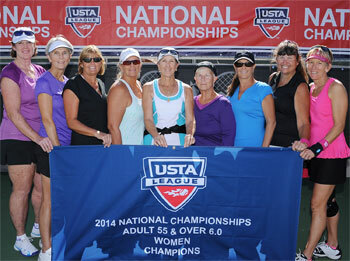 The Ocala women in the final defeating the USTA Midwest Section (Youngstown, Ohio) 2-1. Earlier in the day the Ocala women defeated a team from Knoxville, Tenn., 3-0 in the semifinals. Both men's and women's teams advanced to the semifinals by winning their round-robin flights contested Friday and Saturday. The Florida teams had won the USTA Florida Section League Championships in their respective divisions in April to advance to the national championships. The Ocala men's regular-season roster was comprised of Paul Fusco (captain), Alan MacMurray, Russell Kirk, Ken Rowley, Jay Claus, Frank Owings, Isaac Vergara, and James Saxon. "It is absolutely awesome," Fusco said. "It was beyond our expectations. My guys really wanted to win this. They came through. We met some really great people here. Everybody was really fair. You can't ask for any more than that." The Ocala women's regular-season roster was comprised of Deborah Borge-Shaffer (captain), Brenda White, Fay Owings, Mary Stevens, Jeri Conrad, Charlotte Rozanski, Donna Sullivan, Joan Matlock, Peggy Blue, and Ellen Tarrant. "It feels like we just won Wimbledon," Borge-Shaffer said. "We wanted it for each other and that's what made it the best. I want to thank my team. The whole experience has been great." 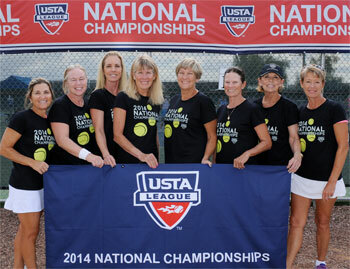 The Florida women's team out of the Monarch Country Club in Palm City won the USTA League Adult 55 & Over 8.0 National Championships, in the final defeating the team from the USTA Texas Section (Houston) 2-1. Earlier in the day Palm City defeated a team from Redwood Shores, Calif., 2-1 in the semifinals. They advanced to the semifinals by winning their round-robin flight contested Friday and Saturday. Palm City's regular-season roster was comprised of Linda Emilson (captain), Tish Wissel, Carol Haffield, Ruth Nordgren, Cynthia Wicker, Sue Anderson, Kathleen Bourret, and Patricia Brimlow. "We were always the bridesmaid, never the bride, and now to win this, we are just so excited," Emilsom said. "We couldn't be happier. We were down, but we hung in there." Established in 1980, USTA League has grown from 13,000 participants in a few parts of the country in its first year to over 820,000 players across the nation today, making it the world's largest recreational tennis league. For more information about USTA Florida leagues visit www.ustaflorida.com.